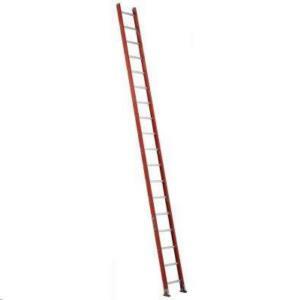 This 16 foot fiberglass single ladder has a load capacity of 300 lbs, rated ANSI Type IA. This ladder features direct rung - rail connection for rigidity and stability, D-shaped rungs, mar-resistant rail end caps, and swivel safety shoes with metal shield. The Louisville FE3116 straight ladder meets or exceeds the safety standards set by ANSI, CSA, and OSHA. The ladder weighs approximately 35 lbs. * Please call us for any questions on our ladder 16 foot straight rentals in Hillsdale and Ridgewood NJ.